“Trees and Me,” a free event to be held in April, will offer hands-on activities and the full-dome environmental science film, Habitat Earth. Families will learn more about the environment of Lower Cape Fear region, with a focus on forests. The Museum will partner with area community groups to explore the longleaf pine, exchange seeds, learn about our interconnected planet and plant a tree in New Hanover County Museum Park. Habitat Earth: Living in a Connected World explores what it means to live in today’s connected world, where biological networks intersect with those built by humans. The film features stunning visualizations of Earth’s biosphere. “Exploring the long leaf pine and our native ecosystems are important components of the Museum’s mission. 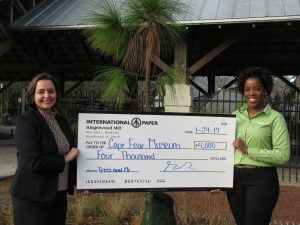 We are excited to share this free program with the public and we are grateful to International Paper for making it possible,” says Amy Thornton, Cape Fear Museum’s education coordinator. From its inception in 1952 and continuing today, the International Paper Foundation supports non-profit organizations within the communities where International Paper has operating facilities. International Paper gives back to communities through corporate donations, in-kind contributions, employee volunteerism and IP Foundation grants to provide millions of dollars to support hundreds of community based educational, civic and cultural programs that uphold their promise to do the right things, in the right way and for the right reasons.